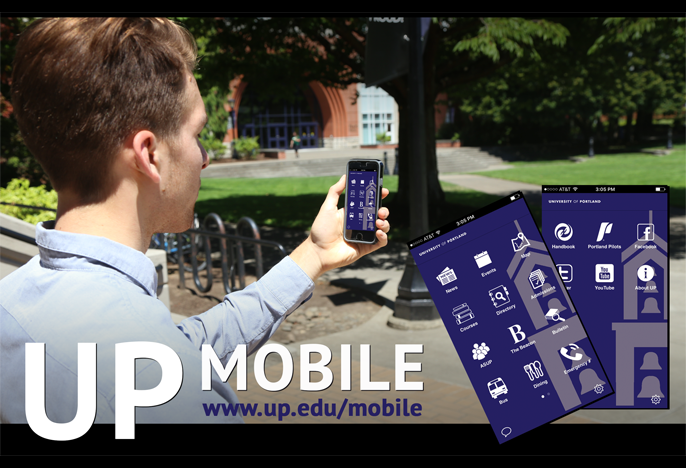 Access University of Portland information and services anytime, anywhere with UP Mobile. Featuring news, calendars, sports, and maps, as well as course information, local bus schedules, and campus dining menus, this app will help you stay up-to-date on campus events and help you access important University of Portland services. It's available on the App Store for iPhone and iPad and on Google Play for Android devices; a Windows mobile app is coming soon. The Bulletin - Find complete academic requirements, major and minor information, and the course catalog in a mobile-friendly format. Clark Library - Access the University's complete catalog, online databases, and reserve study rooms with this link to Clark Library's website. Courses - View class schedules, assignments, class rosters, grades (students only), and discussions. UP account and password required. Admissions - Request information, contact admissions counselors, plan a campus visit, and learn about admissions deadlines. Directory - Browse or search for students, faculty, and staff, and easily connect. UP account and password required. Emergency Numbers - Quickly access on- and off-campus emergency resources. ASUP - Learn about student government senators and executive board, find out about services sponsored and funded by ASUP, and read the latest news about ASUP. Bus - Access Tri-Met bus schedules. Dining - View Bon Appétit's daily menus for Bauccio Commons, The Cove, and The Anchor. The Beacon - Get up-to-date campus news from the students' perspective with this link to the student newspaper's app. Campus News - Read the latest campus news from the University's news bureau. Events - Explore the University calendar and save events to your mobile device. Portland Pilots - Access the Portland Pilots app and read news, scores, and schedules for all 16 Pilot athletics teams. Facebook - Stay up-to-date with news, videos, and event information on UP's official Facebook page. Twitter - Interact with UP's official Twitter feed. YouTube - Watch videos with direct access to UP's YouTube channel and playlists.